Manchester United striker Wayne Rooney has been charged by the FA for using abusive language and now faces a two game ban. The England forward issued a formal apology following his foul-mouthed celebration at West Ham on Saturday, which he claimed came "in the heat of the moment" after he completed a match-turning treble, and insisted "was not aimed at anyone in particular". However, an FA statement on Monday read: "The FA has charged Manchester United's Wayne Rooney for the use of offensive, insulting and/or abusive language. "This charge relates to an incident during his side's fixture with West Ham United at the Boleyn Ground on Saturday April 2, 2011. "Rooney has until 6pm on April 5 to respond to the charge." 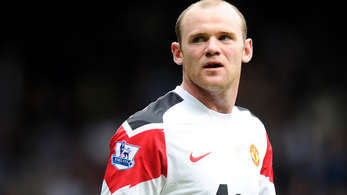 A one-match ban would rule Rooney out of Saturday's home game with Fulham, with a two-match suspension sidelining him for the following weekend's Manchester derby FA Cup semi-final at Wembley. Sanctioning a player for swearing into a camera is understood to be unprecedented in English football. Chelsea striker Didier Drogba was handed a three-match ban - with a further two matches suspended - by UEFA for a similar offence during the 2009 Champions League semi-final against Barcelona but his tirade was deemed to have been directed at the referee. There does appear to be provision for punishment in the FA's own rules about behaviour, which state: "A participant shall at all times act in the best interests of the game and shall not act in any manner which is improper or brings the game into disrepute or use any one, or a combination of, violent conduct, serious foul play, threatening, abusive, indecent or insulting words or behaviour." Rooney's three goals at Upton Park helped his team to a 4-2 victory which took them seven points clear at the top of the Premier League. But, after completing his treble, the striker uttered an audible expletive into a television camera as he celebrated. The game at was beamed around the world by Sky Sports and the incident prompted an on-air apology from the broadcaster. The 25-year-old upset England fans during last summer's World Cup when he turned to a television camera and verbally criticised them at the end of the dismal goalless draw with Algeria.